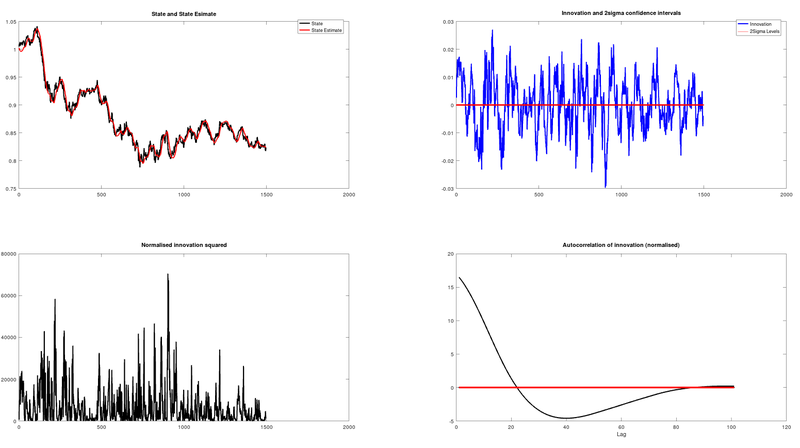 Following on from my previous post, this post is a more detailed description of the testing methodology to test kinematic motion models on financial time series. The rationale behind the test(s) which are described below is different from the usual backtesting in that the test(s) are to determine whether the Kalman filter model is mismatched or not, i.e. whether the model innovations match the assumption that the residuals are Gaussian. where real_pos and real_vel are calculated using the Savitzky-Golay filter and represent the "true" position and velocity of a Constant Velocity model compared to the measured_pos and measured_vel measurements that are taken in real time. These crude estimates of the covariance matrices are used as inputs to the Autocovariance Least Squares Method implemented by means of the Octave ALS package to get a hopefully much more accurate estimate of the noise covariances. Armed with these estimates, the test code as outlined in the above mentioned estimation lecture notes paper and my previous post can then be run. %  Student's t distribution. The default value of M is 0.
zero_mean_innovation_pos = ttest( nu( 1 , : ) , 0 ) ; % innovations are centred around zero? across a range of forex crosses and my currency indices and see if, say 95%, of them pass these tests. 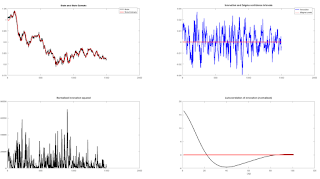 As a result of my first tests thus outlined on the Constant Velocity Kinematic Model I think can confidently say that this model is "mismatched," despite it sometimes being described as the simplest "useful" model, and therefore readers should not use this model in a Kalman filter on financial time series. It is worth noting that this model is named Model One in the Trend Without Hiccups paper, which in turn is very closely related to a local linear trend model, which the authors name Model Two. Given that the underlying model(s) for both are mismatched it is not surprising that the authors report disappointing results from these models. In my next post I shall report results on the Constant Acceleration Model.